“Be gentle,” I tell her. 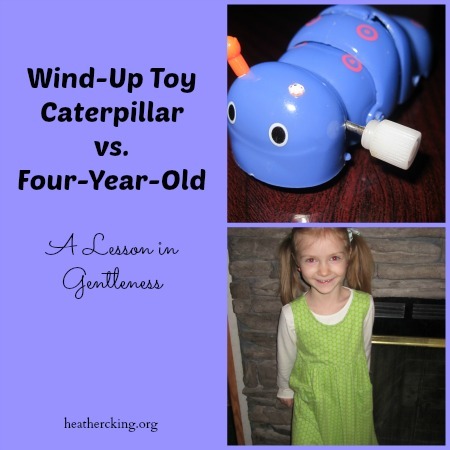 She’s cradling this tiny wind-up caterpillar toy, purple with polka-dots, in her four-year-old hands. Last week, she re-discovered it in the toy bin and declared that it was worthy of show-and-tell. So, she’s waited with excitement all week for that one morning when she could tote it into school and show it to her classmates. I slipped that tiny $1 caterpillar into her stocking two Christamases ago and here he is a survivor. More or less intact, he’s only lost one antenna. But is he up for the trip to the school? Is he hardy enough to face one four-year-old and her 19 classmates? I test him out on our coffee table. Wind, wind, wind and then I let him go. He inches across the wood quickly and my daughter giggles at the sight. We scramble that morning to the minivan, though, all breathless with feeling late, feeling busy, feeling overwhelmed by the day and it’s not even 9 in the morning. She nods like I’m such a worrier. Silly mom. As if I didn’t already know that. I hear that toy buzz, buzz, buzzing during the drive. I hear her tossing that cheap plastic around in her hands. I refrain from “I told you so” and mom speeches. I choose grace. We arrive at the school and she finds the pieces that had fallen into the pile of lost fruit snacks, french fries and broken crayons on the minivan floor. Then, I hold three separate parts of a purple plastic caterpillar and hope my English-major brain can figure out the engineering difficulties of a wind-up toy. Somehow I manage to snap those pieces together. I test him out–success! And then I carry him into her classroom and set him on the show-and-tell table. She flashes me a smile and I know I have earned my Super-Mom cape (and maybe some chocolate as a reward). I am now the stuff of Super-Mom legends. But she leaves out one little part of the story….how he broke in the first place. How she hadn’t been gentle enough. This gentleness with others, isn’t it what we leave out so often? Let your gentleness be evident to all. The Lord is near (Philippians 4:5 NIV). We can can make excuses about how we’re just “honest” or we “just tell it like it is.” That’s just who we are. We can assume the worst, lose patience, rage, condescend and degrade into sarcastic mocking. Or sometimes we have this way of being gentle to strangers, but that harshness, that short temper, that criticism oozes out to the loved ones sitting at our own dinner table. Too often, we know the weakness of the ones we love. Our husbands. Our children. We are their protectors. We should be the healing salve to the hurts, treating wounds with tenderness and grace, overlooking failures, encouraging strengths, applauding efforts. When we’re hurt, angry, frustrated, impatient, though, we tend to stab where it hurts most, highlighting faults and bruising the same feelings again and again. It’s our self-defense; we wound others when we’re wounded. 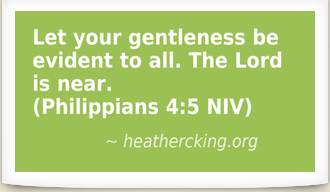 Yet, gentleness isn’t a God-request. It’s not a Holy Spirit suggestion or an option for good days that can be ignored on bad days when we’re stressed, tired, overwhelmed, or haven’t slept all night because we are, in fact, moms. Gentleness is part of living Christ to the those around us, in our home and out of it. We are to wrap ourselves in it so others see Jesus in us. That’s the message I remind myself as I put that wind-up caterpillar back in the toy bin after his show-and-tell adventure. but perverseness in it breaks the spirit (Proverbs 15:4 ESV). and those who love it will eat its fruit (Proverbs 18:21 NIV). but the tongue of the wise brings healing (Proverbs 12:18 NIV). sweet to the soul and healing to the bones (Proverbs 16:24 NIV). There, I exercised. Now can I have a cupcake? Ouch ! Thank you for the reminder. In my busyness I tend to forget gentleness. It’s busyness that trips me up as well, Becky!! A lesson I need to be reminded of too often because I don’t practice it enough! We likely all need the reminder occasionally! The book of James sure teaches that the tongue is hard for anyone to tame!